3pp, landscape 16mo. Bifolium. In good condition, lightly aged, with thin strip from stub of mount still adhering. The male recipient is not named. Thirty-five lines of closely and neatly written text. [ Sir James George Frazer, author of 'The Golden Bough': printed pamphlet. ] Questions on the Customs, Beliefs, and Languages of Savages. By J. G. Frazer, Fellow of Trinity College, Cambridge. J. G. Frazer [ Sir James George Frazer (1854-1941)], Fellow of Trinity College, Cambridge, anthropologist and author of 'The Golden Bough'. Cambridge: at the University Press, 1907. 51 + pp., 12mo. Stapled, in printed brown wraps. Internally in fair condition, on aged paper; in worn and spotted wraps. 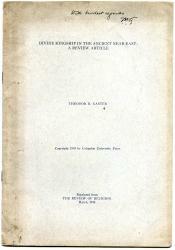 A six-page preface, dated 'Trinity College, Cambridge, | 26th July, 1907. ', begins: 'Many years ago I printed and circulated privately a set of questions on the manners and customs of savages designed to elicit information on the subject from persons who live or travel among uncivilised races. The present set of questions is a revised and enlarged edition of that work. 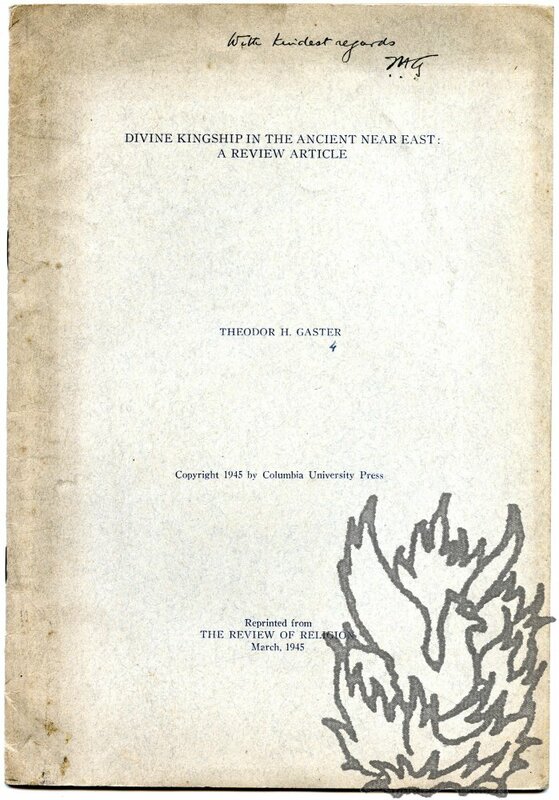 Presentation copy of offprint of article: 'Divine Kingship in the Ancient Near East: A Review Article'. 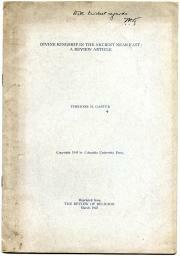 Copyright 1945 by Columbia University Press | Reprinted from THE REVIEW OF RELIGION March, 1945'. 8vo: 15 pp, paginated 267-281, In grey printed wraps. Inscribed by Gaster on front cover: 'With kindest regards | T. H. G.' Good, on lightly-aged paper, in grubby and lightly creased wraps.